One of the great results of writing a memoir is that you are contacted by long lost friends. Notes and photos on the 1984 miners strike had disappeared during my bitter divorce. Addresses too. Yesterday I had a call from Pat Davies who I had not seen for 32 years! I had tried to locate her, husband Selwyn and her family when writing the book, but had failed - until now. 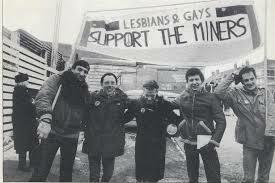 Here is an excerpt from my account of the strike in South Wales ... "I was teaching at Kilburn Polytechnic and my union branch set up a food support group for the Blaenant miners in the Neath Valley, south Wales ... I was one of those who drove groceries down to their families: tinned and fresh fruit and vegetables, cartons of long-life milk, pasta, cheese, biscuits, soft drinks and toiletries. Our supplies were dropped off at the miners’ social centres and distributed by the miners’ wives support group who had precise information on every family’s needs. Proof that a co-operative society can develop under the most extreme conditions. I stayed with Pat and Selwyn Davies in Pen-y-Cae and, over the weeks and months of the strike, we became friends. One weekend I travelled there with the North London Gay Liberation Front. They staged a benefit for the strikers and their families in the miners’ club at the Onllwyn Miners’ Welfare Hall in the Dulais Valley. It ended with a mass hug-in: miners and their wives and children embracing their visitors. That evening has been accurately represented in the 2014 film Pride." Pat and Selly are going to send me photos she has of me and my family and I am sending them a copy of 'Left Field' And I have promised to visit them soon in Pen-y-Cae.